We have served the Shipping Industry exclu- sively for over 40 years and maintain an active file of people experienced in all of its phases— including Port Engineers, Ship Construction Su- pervisors, M&R, Sales Engineers (chemicals, coatings, etc. )—to relocate anywhere. Salaries and fees negotiable; inquiries without obligation and in confidence. 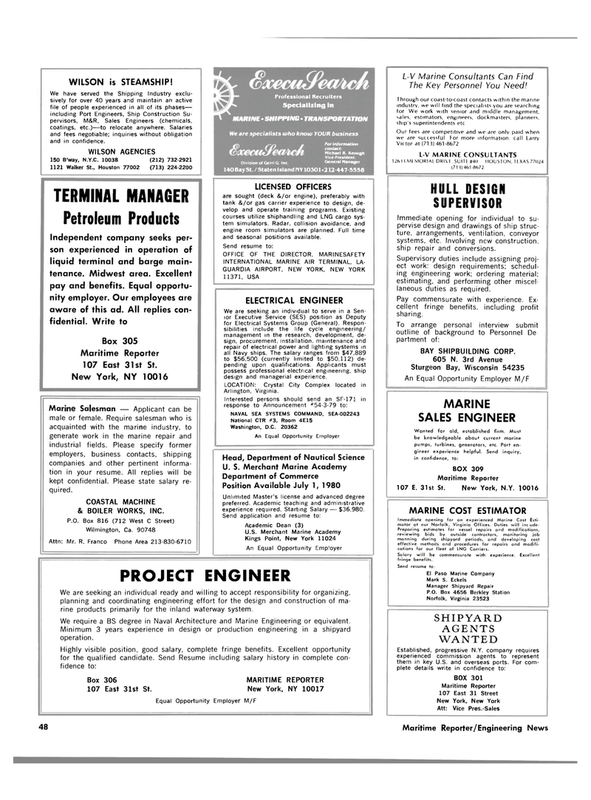 Maritime Reporter 107 East 31st St.
Marine Salesman — Applicant can be male or female. Require salesman who is acquainted with the marine industry, to generate work in the marine repair and industrial fields. Please specify former employers, business contacts, shipping companies and other pertinent informa- tion in your resume. All replies will be kept confidential. Please state salary re- quired. COASTAL MACHINE & BOILER WORKS, INC. LICENSED OFFICERS are sought (deck &/or engine), preferably with tank &/or gas carrier experience to design, de- velop and operate training programs. Existing courses utilize shiphandling and LNG cargo sys- tem simulators. Radar, collision avoidance, and engine room simulators are planned. Full time and seasonal positions available. We are seeking an individual to serve in a Sen- ior Executive Service (SES) position as Deputy for Electrical Systems Group (General). Respon- sibilities include the life cycle engineering/ management in the research, development, de- sign, procurement, installation, maintenance and repair of electrical power and lighting systems in all Navy ships. The salary ranges from $47,889 to $56,500 (currently limited to $50,112) de- pending upon qualifications. Applicants must possess professional electrical engineering, ship design and managerial experience. Unlimited Master's license and advanced degree preferred. Academic teaching and administrative experience required. Starting Salary — $36,980. We are seeking an individual ready and willing to accept responsibility for organizing, planning and coordinating engineering effort for the design and construction of ma- rine products primarily for the inland waterway system. We require a BS degree in Naval Architecture and Marine Engineering or equivalent. Minimum 3 years experience in design or production engineering in a shipyard operation. The Key Personnel You Need! Immediate opening for individual to su- pervise design and drawings of ship struc- ture. arrangements, ventilation, conveyor systems, etc. Involving new construction, ship repair and conversions. Supervisory duties include assigning proj- ect work: design requirements: schedul- ing engineering work: ordering material: estimating, and performing other miscel- laneous duties as required. Pay commensurate with experience. Ex- cellent fringe benefits, including profit sharing. Preparing estimates for vessel repairs and modifications, reviewing bids by outside contractors, monitoring job manning during shipyard periods, and developing cost effective methods and procedures for repairs and mo difi- cations for our fleet of LNG Carriers. Salary will be commensurate with experience. Exce 1 lent fringe benefits.